These stuffed zucchinis are super easy to make, and they look great and impressive. These zucchinis would be perfect stuffed with mushrooms, for a veggie version. Zucchini has many health benefits. Some of these benefits include lowering cholesterol, lowering blood pressure, cancer prevention, heart attack and stroke prevention and it’s also very low in calories. 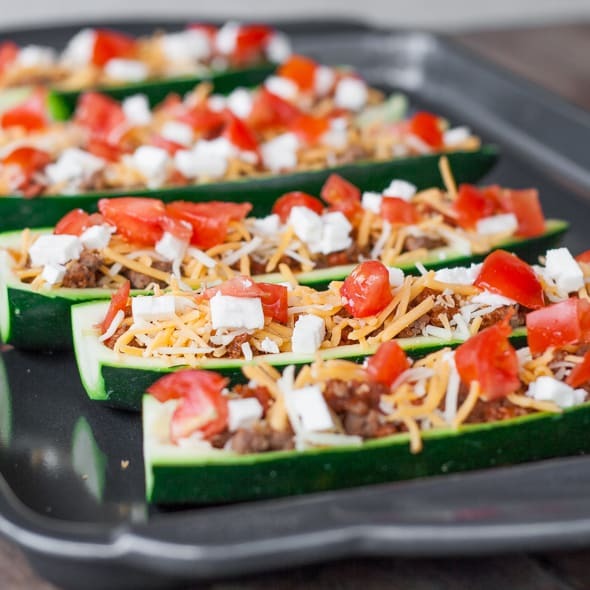 Now besides all those benefits, I simply just like zucchini, I like them added to salads, added to soups or here’s one of my favorite ways to eat zucchini and that is to stuff them. These stuffed zucchinis are super easy to make, and I think they just look great, I think they look very impressive. These zucchinis would be perfect stuffed with mushrooms, and that way you’d have a completely vegetarian meal. However, I had some left over ground meat from the nachos I made so I decided to fill them with the ground beef mixture. I used 3 large zucchinis for this recipe. 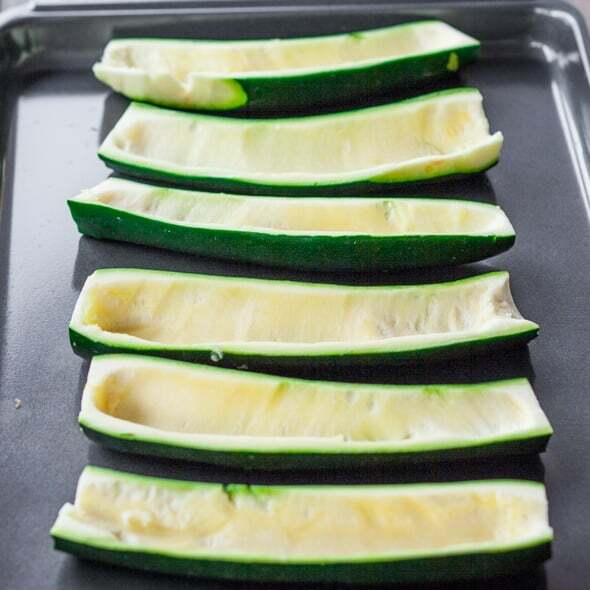 Wash the zucchini first, then cut the zucchini lengthwise and using a spoon, scoop out the flesh of the zucchini. As I said I used some leftover ground beef I used for the nachos, so the mixture is made up of ground beef, chorizo sausage and to this I added a bit of spaghetti sauce. You will need about a cup of this meat mixture. If you wanted to make this a vegetarian meal, you could use the flesh of the zucchini mixed with mushrooms and some chopped onions and it would be just delicious. Anyway using a spoon, fill the zucchinis with the meat mixture. Now I had some goat feta cheese, and feta cheese is one of my favorite cheeses, if not my favorite. Pair this feta cheese with tomatoes and you’ve got yourself a winner. So for these zucchinis I also used some shredded cheddar cheese, because it melts nicely, so I topped the zucchinis with a bit of cheddar cheese first, to which I added some feta cheese and tomatoes. They already look so delicious and are not even baked yet. Bake these babies for about 15 to 20 minutes in a preheated 375 F degree oven. Now it all depends how you like your zucchini, but I like to still have a bit of crunch to mine, if you don’t, then bake them a bit longer. If you guys love this recipe, and most importantly make it yourselves, please let us know. Leave a comment below and rate this recipe or take a picture and tag it #jocooks on Instagram so we can see it. I always love to see what you guys come up with! In a skillet, add the ground beef and cook until it's no longer pink. Add the cumin, salt and pepper to it and stir well. Add the chorizo sausage and spaghetti sauce and cook for another 5 minutes, over medium heat. 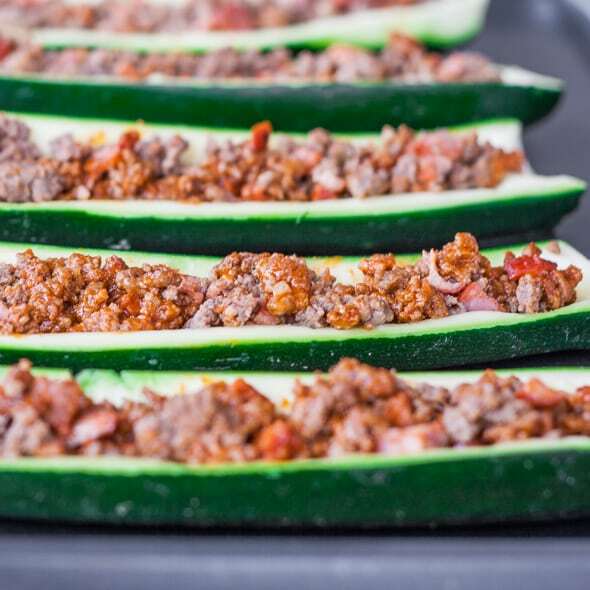 Fill each zucchini half with some of the meat mixture. Top with shredded cheddar cheese, feta and tomatoes. 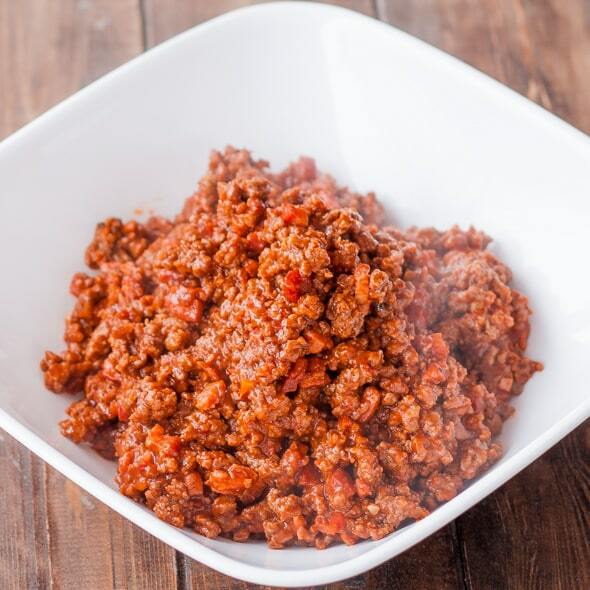 I used grass fed ground beef and cottage cheese with this recipe. I have made it 3x. Thank you! Made this for lunch today! Incredible, we loved it! thank you for such an easy and delicious recipe! Love, love, love this recipe! We make it all the time!! So you use chorizo sausage?? I go to this little Asian market by my work and all I can find is the chorizo sausage in a tube (like ground pork bush mushy). It’s delicious but I never know where to get the sausage links..? Grrrrrrreat recipe! In the oven now!! I find them at CO-OP here. Glad you like the recipe! I made a veggie version: onion, pepper, garlic, baby portabellas, and some of the zucchini from the middle. Very good! Just made these with small zucchini… still in the oven but zucchini seems to be as hard as when I put them in 15min. ago. These were amazing, and so simple! We just finished the entire pan! Thank you, this was the perfect recipe for my new healthy lifestyle. Tomorrow we’re going to try it with yellow squash, since we still have half a pound of the meat mixture left. I’m going to try this tonight, but do you think there’s a way that you can incorporate the zucchini you scoop out into the recipe? It feels like a waste. These look wonderful! There are so many ways could vary the filling based on what you have on hand. I can’t wait to play around with ideas… fantastic! Wow! 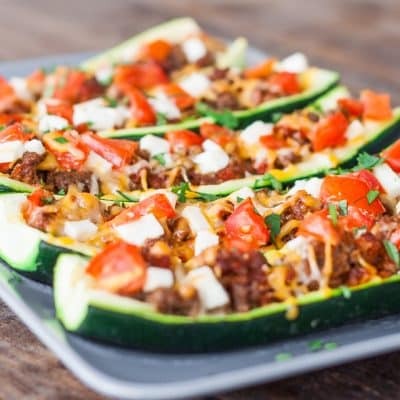 Looks so flavorful…I love that you have used zucchini, very low in calories and rich in flavonoids…This is a perfect dish! Delightful! This recipe is really easy to follow. I made it for my family and they loved it! Thanks for the recipe! … You might as well take a glimpse at http://www.gourmandia.com and http://www.everythinglemon for more exciting recipes that you’ll surely admire! Thanks Tifanie, I will take a look.